As mentioned earlier one of the key assumptions in technical analysis is that, we rely on the fact that the history tends to repeats itself. This probably is one of the most important assumptions in Technical Analysis. It would make sense to explore this assumption in greater detail at this juncture as candlestick patterns are heavily dependent on it. Factor 3 – The range in which the stock trades today is quite small compared to the last four days. With these factors are playing in the background, let us assume that on the next day (8th July 2014) the fall in stock gets arrested and in fact the stock rallies towards a positive close. So, as an outcome of the 3 factors the stock went up on the 6th day. Time passes and let’s says after a few months, the same set of factors is observed for 5 consecutive trading sessions. What would you expect for the 6th day? According to the assumption – History tends to repeat itself. However we need to make an addendum to this assumption. When a set of factors that has panned out in the past tends to repeat itself in the future, we expect the same outcome to occur, as was observed in the past, provided the factors are the same. Therefore, based on this assumption even this time round we can expect the stock price to go up on the 6th trading session. The candlesticks are used to identify trading patterns. Patterns in turn help the technical analyst to set up a trade. The patterns are formed by grouping two or more candles in a certain sequence. However, sometimes powerful trading signals can be identified by just single candlestick pattern. Hence, candlesticks can be broken down into single candlestick pattern and multiple candlestick patterns. Of course you must be wondering what these names mean. As I had mentioned in the previous chapter, some of the patterns retain the original Japanese name. Candlestick patterns help the trader develop a complete point of view. Each pattern comes with an in built risk mechanism. Candlesticks gives an insight into both entry and stop loss price. Before we jump in and start learning about the patterns, there are few more assumptions that we need to keep in mind. These assumptions are specific to candlesticks. Do pay a lot of attention to these assumptions as we will keep referring back to these assumptions quite often later. Buy strength and sell weakness – Strength is represented by a bullish (blue) candle and weakness by a bearish (red) candle. Hence whenever you are buying ensure it is a blue candle day and whenever you are selling, ensure it’s a red candle day. Be flexible with patterns (quantify and verify) – While the text book definition of a pattern could state a certain criteria, there could be minor variations to the pattern owing to market conditions. So one needs to be a bit flexible. However one needs to be flexible within limits, and hence it is required to always quantify the flexibility. Look for a prior trend – If you are looking at a bullish pattern, the prior trend should be bearish and likewise if you are looking for a bearish pattern, the prior trend should be bullish. In the next chapter, we will begin with learning about single candlestick patterns. Look for a prior trend. Team Zerodha……keep rocking. Special thanks to Mr. Karthik Rangappa for his way of teaching!!! Please do stay tuned for further updates. Don’t you think the advice to buy on a bullish trade and sell on bearish trade is wrong? In fact, one should do the reverse of that. What do you say? The other way to look at this is – you are buying strength and selling weakness. It is just an assumption but analysing logically, when we are buying during blue candle day, it means we are paying more for a stock and the high price we paid for the stock may go down after sometime. Then how come we buy strength and sell weakness here? Consider this, a stock moves from 100 to 160 in 3 months, this is a 60% move. Buying this at 100 and selling this at 160 is easier said than done. You cannot time is unless you have luck favoring you. So instead of trying to time and aspiring to catch the entire 60% move, I’m happy buying at 120 (after ensuring the trend has established) and selling around 145-50. So in a sesnse, you catch a portion of the big move, which is completely fair enough. Like u said before TA/ candlsticks is for short term or intraday trading.What if a person is trying to trade for long term period given that its fundamental is strong than he has to do the opposite ,right? If you are trading long term, I’d suggest you don’t really look at TA. How would it matter if you bought a stock at 100 or 103 in the longer run? Sir, Is it necessary that a candlestick pattern has to have a high/ low price of a trend ? Referring to the image, does the last candle indicate Bearish Engulfing pattern. Thanks. Sorry. Forgot to upload the image before. Yes, infact I can see 2 bearish engulfing patters here. 2 Bearish Engulfing Patterns means, In the last of the Graph only you can able to see it right? Unable to get the context Saikiran, can you please elaborate. Thanks. Can you tell me or Draw a circle Where you are seeing 2 Bearish Engulfing Patterns..So that i can co relate with what i have studied in your Article..
Are you sure this is in context of this chapter? I’m unable to spot the line where I’ve mentioned ‘2 bearish engulfing pattern’. Can you kindly help me place it? Thanks. Sir thanks for this information which u provided but wat timing of candle stick we have to consider . Bcz there r sever period candle stick such that 1 minute , 5 minute n 15 minute n 30 minute candle sticks r there so which time candle stick is better to predict the market . The shorter the time frame, the higher is the noise component. Given this, I’d suggest you stick to at least 15 mins while trading intraday. Firstly, What the third candlestick (from left) suggest as there is no body part? secondly ,Why some candlestick have dark green and some have light green? lastly, You mention somewhere that if BODY part is LONG then it may be good signal. Is it true? Or I understood wrong? I think first candle you are referring to could be a marubuzo. Kindly check for that. I’m not sure what the dark green candle indicates, it could be a software specific issue. Long body indicates a more pronounced price action, please view this along with other technical parameters. Yes Yes , I read MORUBUZO rit now!! Thanks!!! Can u plz elaborate “Be Flexible, Quantify and Verify” with a good and simple example or provide me link. 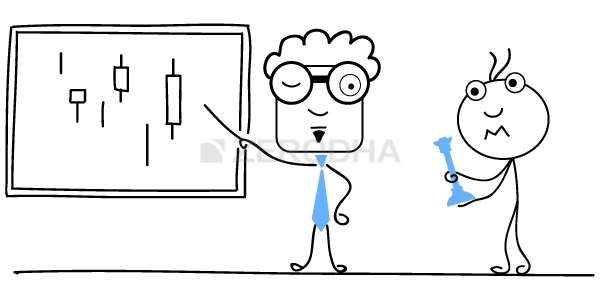 I have explained this in section 5.2 of this chapter – http://zerodha.com/varsity/chapter/single-candlestick-patterns-part-1/. Also request you to please do go through the initial few comments. I don’t see things you are talking about anywhere in the chapter. I am missing something? Which topic are your referring to? what candlestick pattern to see and trade in intraday . is there any software which recognise the formation , which time frame to use . You can look for both single and multiple candlestick patter while trading intra day. Zerodha’s Pi has a pattern recognition feature which can be used. the above said in chart mother and child pattern , buy above the mother candle keeping low as stop loss. Be flexible with patterns (quantify and verify) – what does it mean, how much to be flexible and how to verify it. This means, whenever you are looking at candlestick pattern don’t always look for textbook definition of candlestick patterns. Textbook definitions are good, but need not always be true in real markets. For example a bullish marubuzo is defined by 0pen = low & High = Close. This means there is no upper or lower shadows. However in real mkts you could have a small shadow and you should still be flexible to identify it as a bullish marubuzo. This is what I mean by ‘be flexible’. However you also need to quantify what you are being flexible with. Thanks for this excellent tutorial. It has been very useful. However, on the trading day, how do you determine if it is a blue / red candle day? Because at that point you only know the open price and the candle for the entire day is not yet formed. Did you mean the intraday candle formed for that day till that point should be blue/red? Exactly – so if you notice throughout the module I have suggested buying/selling only around 3:20 PM which is towards the close of the day. Around 3:20 PM you will be able to ascertain if it is a blue/red candle day with conviction…and hence take the required action. But why should one buy on a blue candle day and sell on a red candle day? Won’t buying on a blue candle day would mean paying more, as the prices would have moved up? And selling on a red candle day would mean selling for less, as prices would move down on such days? How is this profitable, and shouldn’t we do just the opposite? Sorry, if my questions sound stupid. I am a beginner and this concept doesn’t make sense to me. Buy strength (represented by a blue candle) and sell weakness (represented by a red candle) – this is an integral part of trading based on CS pattern. I have had the same thought while reading. Can anyone explain why we should not we be doing the opposite? You do this with an expectation that the prices would drift further (in the direction of the trade). Taking an action on Blue/Red candle day only enhances the probability of a profit. Even if we come to know at 3:20pm that it was bullish or bearish day then what one can do as after 3:20pm system will not allow you to trade.Can you please give example how one can use this info. You can always trade derivatives in NRML. Why have you removed Ctrl+F option from Z-connect blogs ? It was very useful to navigate through the blog while searching for a specific word/term etc. Please enable the same ASAP. Ctrl+F is a browser specific search function which may be different on other browsers. Why don’t you try F3 if Ctrl+F doesn’t work for you. if we sell it on a red candle day, wont it result in loss for the seller? Selling on red candle day means short the trade and profit out of the falling prices. Zoom in just enough to see the candles with great clarity. Make sure you dont load too many data points, if you do then the chart may look highly cluttered. So take care to zoom in just as much as required. or it is open or close tail? The long and short tails here refers to the swings the stock makes wrt to its open or close. For example in a bullish candle, the lower tail refers to the range between the open and low and the upper tail refers to the range between the close and high. Likewise in a bearish candle, the lower tail refers to the range from close to low and the upper tail refers to the range from open to high. Really helpful venture by you which is a boon for young investors like me. I just started trading and the thing i noticed is there are too many advisory firms providing tips on trading. However they do not clarify on how the particular trade has been selected. I would really appreciate if you could help me in the matter as its quite confusing for me, by suggesting a proper advisory panel. The idea with Varsity is to empower you with all the knowledge one needs to identify his own trade, seeking an investment/trading advice would defeat this purpose. Kudos to this spirit ! from single candle how can we determine to buy.Was that for intraday trade for the next day or long trade. Vikas, the color of the candlestick is just 1 of the parameters, there are many other parameters in the checklist which should satisfy before you initiate the trade. So please make sure all of them satisfy before you pull the trigger on the trade. Can you help me with this? In a daily chart, 1 candle represents 1 day. Since the market closes at 03.30PM and only opens the next day at 09.00AM, there is a “closed/non-trading” time. Opening price does not have to be equal to previous day’s closing price. But for an intraday chart where 1 candle represents a few mins (or an hour), there is no “closed/non-trading” time between successive candles. In that case open price of a candle should always be closed price of previous candle. There can be no “gapping”. I know this idea is wrong, but I don’t know where I am going wrong. I therefore want to understand the construction of intraday candlestick charts. No patterns, signals etc. – just the construction. Raj – intraday gaps are possible. In fact it intraday gaps happen all the time. This means ‘minute 1’ closing need not necessarily be ‘minute 2’ opening. Raman – there are plenty of examples quoted in the following chapters, suggest you to please look through the same for clarity. Let me know if in case you find it difficult. looking at a bullish pattern, the prior trend should be bearish – Can you please explain with an example as you do. I understood whole chapter and not this line. Most of the patterns discussed are ‘trend reversal’ patterns. By definition, a trend reversal pattern requires the opposite pattern in the past for it to be considered as ‘trend reversal’. So a bullish pattern needs a bearish prior trend and vice versa. Sir you and zerodha are doing fantastic job by bring in this tutorials, thank you very much for creating technical analysis literacy among us, your resources are to the point and very very easy to understand. I have a question – should candlestick patterns be used as one of the indicators for intraday high frequency trading when I have pattern confirmation by looking at candles from past few days along with some other indicators. Also should I look at daily candlesticks over past few days or should I look at only intraday candles with patterns confirmation? Because the idea is prepare today for tomorrows trades. If the idea is to prepare today for t’row’s trades then I would suggest you look at EOD data. Do note, I’m assuming you are new to trading here. Also use candlesticks on a stand alone basis…indicators should complement your candle studies. Thank you so much for the reply sir. I’m presuming by EOD data you mean to say daily “open high low close etc” data for past few days, please correct me if I’m wrong. Another question is what if some pattern observed on intraday candlestick 5min or 10min chart or perhaps some other minute time frame chart? Is it useful to generate buy/sell signals? Because sometimes there is lot of action on intraday itself, so can candles prove as good confirmation on intraday trades. If so what time frame you suggest for intraday candles? P.S. yes I’m new to trading but I’ve been testing my programmes/algorithms in live market for quite a some time now. Yes, EOD refers to the day’s open, high, low, and close data. Yes, you can initiate trades on a intra day basis by observing intra day patterns…although you need to be aware of the fact that lesser the time frame the higher is the noise component. I would suggest you use 15mins candles. Thank you so much Sir for giving your valuable insights, your guidance will prove very useful and productive for me. Thanks a lot. Glad to know this Mehul! Good luck and all the best. Specific to RIL, if you were to look at the charts across any time frames then you will realize that the stock is trading in a range -between 875 to about 1020….which means to say any movement between these two price points is very transient in nature. Trades within this range are well defined and has to be super quick. Another important aspect of our stock market is f&o positions especially the outlook of those who written it…for instance,take Infosys,in January it announced stellar result,stock rallied from 1085 to 1130 on result day,even after the result which surprised street and analyst alike did not move up,not even closed above 1040 once on entire 14 days of trading in January post q3 result but as soon as Jan expiry over it moved to 1064 next day in 2 days it reached 1090 now hovering around 1070/1080 range…if there is something significant it was unraveled in result but then it did not move now it is flying ….In such conditions really doubt any such thing called fa and TA or only the positions in options by the Biggie’s is more important??? Trading and investing are two different animals 🙂 You need two different mentalities and thought process here. Also, the answer to this is not straight forward and it really requires you to know both TA and FA well. Once you are comfortable with both you will eventually understand (at least in parts) on whats happening in the markets ! Thanks for valuable information sir. I t helped lot understanding trade for a totally newbie like me. I do not had any trading account. Sir i have few doubts. Sir where can i get the list of stocks/ shares available to trade. If I had sell in intra day than is it compulsory to buy n vice versa 2. What happens if there is no buyer for the stock which I am willing to sell will my order get cancelled.3. I am willing to open an account with you what is the minimum amount should I had in my account to start trading. & last can I tfr money from my trading account to my bank account. 4) There is no minimum amount required – please do leave your details here – https://zerodha.com/open-account someone from sales will get in touch with you and follow up. 5) Yes you can transfer money from your trading account to bank account and vice versa. if zerodha varsity is the only thing i read would i know all the things i absolutely “need” to know about trading before entering the stock market? If you read through Varsity, I can assure you, you will be much better placed than many others. But please do be aware.. like other things in life, one has to always keep learning and adapting. I have just started my account in Zerodha and I must say I am damm impressed with your services and initiatives to educate investors. In this chapter , I am having one doubt on – “Buy strength and sell weakness”. Shouldn’t it be the other way round i.e. buy when weak i.e. price is low and sell when price is high ? I am not a day trader as such but more like a mid-long term investor who is planning to use the tools of technical analysis to figure out a good entry/exit price. Buy Strength indicates that you buy when the markets are going strong so that you can ride the bullish momentum, likewise with “Sell on weakness”. I am now too confused.If I buy when markets are going strong , wont I be buying at higher cost ? Yes, you buy when the strength is good and therefore you get to ride the wave :). Thank you for these materials. It is really refreshing to see such efforts. I am trying to get started with technical analysis and the data science aspects. Could you please say where one could find historic minute by minute or even hourly data for NSE (for either free or even at a nominal rate)? I have been able to find daily data, on nseindia and yahoo but no luck finding higher frequency data. I am a short term positional trader, I mainly follow two indicators 1) Williams %R, 2) AD. I generally do purchase stocks in the range of -80 to -100, (as per first indicator) but lots of time with lots of stocks in its falling period or say a downtrend when I wait for it to reach -80 to -100, it takes U turn from from -50, -60, or -65 range and reaches to -20 to -1 level. So what do I do to catch them in midway of their downfall and get benefit of their up move? I can relate to this, what I have figured over the years is that you need to define your rules and stick to it no matter what. You cannot trade every stock, every opportunity..we just need to trade what the system suggests. Dear Karthik… and what the “Williams %R” suggest according to you, and how do i deal with it. Vikash – hard to explain as a comment. Will probably put up a post on it sometime soon. One general suggestion can we get intimation through email when you or any other person writes something on my question/Comments? Sure, I’ll check if this can be done form our end. Cheers. Sir,All technical analysis books say ” Buy Low ,Sell high”to make profit. In other words, it means Buy when Bearish and sell when bullish. But you say ” Buy strength and sell weakness “. would you kindly explain this apparent contradiction. Buy low and sell high is good to say, but hard to implement! Buy strengths sell weakness implies that you go with the trend! Its like this – you buy on strength with an expectation that the stock will continue to display strength, and therefore you will profit. Likewise, you will sell when there is weakness, with an expectation that the stock will continue to display weakness. The whole idea is to go with the trend here, rather than going against. The price action trading and study the candle stick patterns are the same or the different kind of thing? Please explain. And, I’ve one doubt about the speculative and non-speculative in F&O section. If i do F&O on intraday basis (MIS, BO, CO in F&O Instrument), it’s consider as speculative or non-speculative?!!! Price action leads to formation of charts, charts can be candlesticks, bars, renko or any other form. Regarding taxation, its best you post it under taxation module. still confusion not clear karthik, I read some article about the price action trading strategy, they using very few indicator and moving averages and they give important on the pattern creation and predict the direction. they look like about candle stick pattern reading (study) strategy. That’s why i’m asking both are same or not? Please clear my confusion. Yes, price action is nothing but the way a stock has traded during the day. The price action can be translated to graphs. In others words – they are the same but people use different terminologies. 1.Which type of analysis is suitable for the Intraday commodity trading. 2.Which pattern i should use ? 3.At present i am using a 5 minutes candlestick chart , Is that right to use. 4.At present i am trading only in Metals ,kindly suggest some best analysis & patterns to study & follow. No two trends are similar, they all vary. I would suggest you pick up Japanese Candlestick pattern by Steve Nison. which book will work best for intraday trading for 30 min graph for TCS,HINDPETRO,ONGC,BPCL,RELIANCE in NSE? same book Japanese Candlestick pattern by Steve Nison ?? sugest other book also price does not matter.. Yes, I’d suggest you start with Steve Nison;s books. You could also look at Alexander Elder’s, ‘Trading for a living’. I have purchased Steve Nison book but he has not mentioned marzuno pattern.. Rectangular pattern…. Why?? Its best to ignore it, for the simple reasons that sentiments change overnight. Mr.Karthik Rangappa…you sir, have a great style of teaching. There’s so much valuable information here. Love you Zerodha! Thanks for the kind words, Nadeem. Good luck and happy reading. 1) Buy strength and sell weakness and, 3) Look for a prior trend. 3) All CS patterns come with a prior trend, you need to look for these before setting up a trade. thanks to zerodha for your varsity program. Hi Sir, please share your thoughts and opinion on continuation patterns like Flag and Triangles. would you advice to trade on these patterns. also do you have these details in Zerodha varsity. if not, can you please recommend any material or youtube videos or websites. Thank you. Yes, certainly. These are good patterns to trade on. I’d suggest you read these from the book on Dow Theory authored by Edward Magee. There is one bug in Charting on Kite Web. Raised under ticket 498701. Basically if you select 1 D (1 day) as timeline then current day candle mix with yesterday candle and combined 1 candle appears for today which is wrong. Yesterday candle comes correctly, but only todays candle is wrong as mentioned above. Also when you open a chart then for 1 second it shows correctly and then immediately it start showing wrong. Please ignore above message. Actually my computer was set to different timezone hence the above issue was coming. still if you which you can correct it such that chart is not dependent on system watch. Saurabh, I don’t think there is any bug in the charting. I just opened about 10 charts to reconfirm this. They all seem to be working perfectly fine. Are you sure you are looking at the right timeframe? By the way, there is no 1 second chart….the minimum look back period is 1 minute. I cannot thank you guys enough for providing us with this sort of education. Just one question, previously we were able to download the PDF files which really helped to through different topics. But now I was not able to find a link for it and also unable to login with my Zerodha ID. Hope to get an answer soon. Thanks for the kind words, Karan. We have started uploading the PDFs already. It should be done next week. COuld you please elaborate on the point “Be flexible with patterns”..? They are essentially the same. I’ve explained Bullish Engulfing later in the module. I have a query regarding the first assumption for candlestick “Buy strength and sell weakness”. I am confused with this statement as normally i have heard experts saying that we should not worried and sell if stock is going weak , it should be considered as a golden chance to purchase the stock at cheap price. Please correct if i am wrong. Buy strength and sell weakness helps you stay in the direction of the trend, Manish. I was so upset that, I placed the order for tata motors at 9:1 am in pre market even at high price than previous day close at Rs 403.86. Placed order at 404 but, exchange don’t alloted me any share. After market opens it jumped to 28 points and tata motors was trading at higher price than 426. I don’t know why they don’t alloted me, why????? ? ? ? i missed a chance of great profit… ??? Sorry previous day close was much lesser 401.50. I think there was too much rush to buy this share. What candlestick timeframe should I choose for swing trading or indraday trading ? Should I choose 1 day /1 hours/15 min ? For swing trading where you will hold the position for few days, you need to look at EOD chart (day). Sometime 1 hour candlestick chart shows some pattern but 1 day chart may show different pattern. So, with what duration should I follow the candlestick chart (1HR/4HR/1DAY etc)? Yes, candlesticks capture the sentiment for the given time frame. This is because of the difference in time-frequency. It really depends on the timeframe you are trading with. I have noticed following points in the candle sticks pattern chapter 4. I am a bit confused , On buying an option on a blue candle day , as the price goes higher, by selling at the peak rate the trader can book maximum profit. Am I right or wrong? In this context how can the above POINT – A will be evaluated. 1).Buy when blue and 2).sell when red- it meant about volume strength, am i right or wrong. And if wrong please simplify. Refers to the candlesticks, which represents the price action for the time frame you are looking at. This is a really valuable content for beginners like me. I thoroughly appreciate your efforts. I have a questions from this chapter. You have mentioned Buy strength and sell weakness. i.e. to buy when the candle is blue and sell when the candle is red. But why can’t I buy when the candle is red and the prices are low? Eventually the candle is gonna be blue according to the theory of History repeats and I can sell at that time to make profits. Your theory is perfectly acceptable when it comes to Fundamental Analysis. Read Module 3 that comprehensibly covers this. I am reading this book and its AMAZING :). Hye sir,can you provide any intraday strategies module? Working on it in the current module on Trading systems. Meanwhile, you can use all the candlestick patterns for intraday as well. “Strength is represented by a bullish (blue) candle and weakness by a bearish (red) candle. Hence whenever you are buying ensure it is a blue candle day and whenever you are selling, ensure it’s a red candle day.” If we buying at blue candle day means market will be good and stock prices will be higher and as well if we are selling red candle day means we are selling at lesser price. Please clarify this. We are essentially buying strength on a blue candle day and selling weakness on a red candle day – this is with an expectation that the markets will continue to move in the direction of the sentiment indicated by the candle’s color. Can someone tell me how do we determine that it is a blue candle day or a red candle one? By look at the candle – they are colour coded. is it possible that if we trade in very small time frames like 1 min then the consistency of profitable trades increase since our targets are very small? No, not really. Remember the shorter the time frame, the higher is the noise component. I’d suggest you stick to longer time frames while trading, at least 15 mins. I am still not able to understand the logic behind ” Buy strength and sell weakness”……please give me an example so that I can understood this. Shekhar, it is straightforward – Buy strength means you buy on a blue candle day. Sell weakness indicates you sell on a red candle day. Yes you are correct but my question is that like if I want to trade then I should buy on a bullish trade an sell on a bearish day. Yes, that is how it should be done. Good luck. by sell do u mean short sell? If its a fresh position then yes, it refers to shorting. Else it could also mean you are selling an existing long position. I have one query . The statement which states that selling on bearish candle means selling a stock which we already bought or starts a trade by selling stock which we dont have in our hand ?? It means the short sell or not ?? Sorry for bothering you with same kind of questions which you mostly answered. Yes, that is referring to a short trade, Anish. When you say “whenever you are buying ensure it is a blue candle day and whenever you are selling, ensure it’s a red candle day”, what does blue candle day mean? on the daily chart the candle should be bullish/blue? Blue means bullish, and red means bearish. Also on the third point, looking for a prior trend, what if the trend is continuing over few days? Will the above-said patterns hold good in such a scenario? Yes, as long as the trend continues, the patterns hold good. Hi Kartheek, I have newly started trading in the stock market and while reading through this chapter I did not understand one point i.e. Buy strength and sell weakness. If we do so don’t you think one will be in loss ? I mean I always buy when the share price is in red (down) and sell when the share is bullish. Please clear my doubt. Not really, you are essentially participating in the same direction of the trend here. How do we decide before buying/selling during intraday that it’s a blue candle day or red candle day? I mean, how it is possible before end of the day (before 03:20 PM)? Does it mean that “the moment” we buy/sell during inyraday should be blue/red! If you are looking at EOD charts, then I do understand that it is not possible. However, at 3:20, you will be able to make an estimate because the price does not change much between 3:20 to 3:30 PM. So using this data, you have a conclude the colour of the candle and assume positions. You are the best sir!!!! Keep building knowledge of your fellows 😀 Cheers!!! I am observing that most of the time the closing price of every stock is not same in chart & watchlist. Not really, Aditya. Markets close at 3:30 PM and it holds true for every stock listed on the exchanges. Which is the best screener for candlestick pattern analysis..
How much time it would take to complete zerodha varsity completely as it contain many modules and chapters? There are 10 modules for you to choose from! Hi , Just one basic question – in candlstick graph for one day – open and close remains constant for previous day right. I mean open and close price is the static value right or how we define the open and close in 15 minutes graph.If it varies then what does it define? Open is fixed, but the close depends on the CMP. Whats your personal opinion regarding tick charts and can they do any better then normal candlestick charts . I just started my carrier in stock market. Studing TA to understand the right time to buy and right time to sale in both the condition of shirt term and long term buy. Simulaneously alao studing fundamental analysis. Good luck, hope you like all the content available Zerodha. You have explained the topics very well. If you could add some exercise or a case to practice so as to cover complete chapter or module. Or sir, if you can suggest an exercise/case solving book or website to practice your modules/chapters. Viplav, I understand. We are trying the enhance the module, hopefully, this will be available soon. Thanks. Am i correct or i misunderstand it ? Yes, Vinay, when you are looking for a bullish pattern, the expectation is that the stock price will go up over the subsequent trading sessions. So sir if presently there is downward trend in share price ie. bearish situation ,why i will think that the share prices are gonna go up ? You are looking at a reversal from the bearish phase, so essentially a bounce back is what you are looking for. Super interesting and the way you explain things, I am getting the interest to read more. I just wanted to ask you, since I am little Old School boy, I like reading from books or hard copies. Would it be possible to get the pdf format of this material so that I can print them and read? Actually I like marking the imp points while reading.. Thanks a lot.. Reading is becoming more interesting. 🙂 Cheers. I have some basic issues and confusions and at this point of time only one. Going forward I know there will be many more. By the way do you provide any classes? Thanks for all your valuable information on Stock Market and Analysis. I have started trading more confidently after reading all the stuff on Technical Analysis. Else, I might have dropped the idea for trading after few losses when I started with no information. I have started my own blog for Technical Analysis and Stock tips. Thank you for your kind wishes. Hi, Candlestick Pattern recognisation tool is available on trading view or not? Candlestick charting is available, Balwan. But the recognition tool is not. Crisp n crux is what needed today and you guys are gem into this. Great initiative! Thank you for sharing your knowledge and experience with us and educating us. I have one lingering doubt and hope you will be able to clarify it. Several times I have witnessed a bearish trend followed by few sessions (4-5 sessions) of sideways movement and then followed by a bullish candle pattern resulting in bullish trend for the next few sessions. So, my question is how should we view the trend prior to the bullish candle pattern? Should we view them whole as a bearish pattern, ignoring the sideways movement? Hope I have clearly defined the problem. Ashutosh, yes, you can include the sideway moment to get a bigger perspective. However, ensure that the prior trend is bearish for any bullish outlook. Your prompt replies are really commendable! in the assumptions for candlesticks, what does look for prior trend mean? i didn’t get that point? The prior trend check simply involves checking how the price has moved over the last few trading sessions. Varsity by Zerodha © 2015 – 2019. All rights reserved.